Well at least one we hope: Kerry Andrew, the head judge of our very own Walter Hussey Composition Competition. 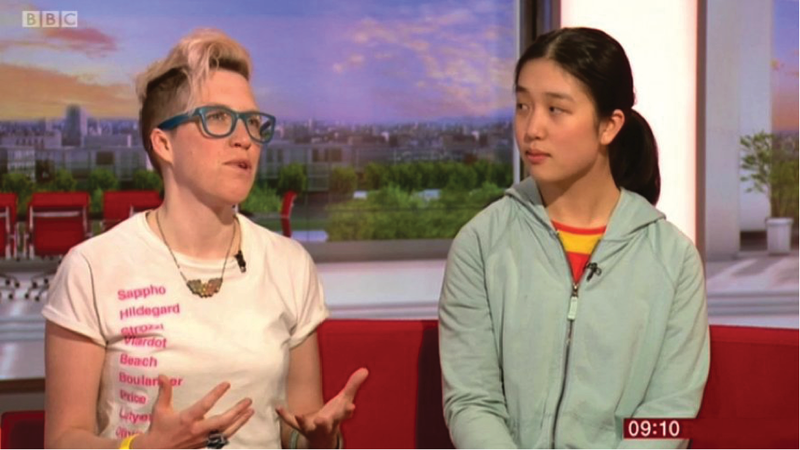 Did you see her recently when we lent her out to the BBC as Chair of the Judging Panel for Young Musician of the Year 2018, not only on the live broadcast of the Final, but also on BBC Breakfast with the winner Lauren Zhang, who played the fiendishly difficult Prokofiev Second Piano Concerto? Anna Meredith, Hannah Kendall, Cheryl Frances-Hoad, Dobrinka Tabakova (also an adjudicator at BBC Young Musician), Kate Whitley, Lucy Pankhurst and of course – Kerry Andrew. Answers: Sappho (born c. 612 BCE), Hildegard von Bingen (1098-1179), Barbara Strozzi (1619-1677), Pauline Viardot (1821–1910), Amy Beach (1867-1944), Lili Boulanger (1893-1918), Florence Beatrice Price (1887–1953), Elisabeth Lutyens (1906–1983), Pauline Oliveros (1932-2016). …all composers if you hadn’t guessed!